Getting our bearings in Nata Bird Sanctuary. Scouting the way to the platform from the roof. 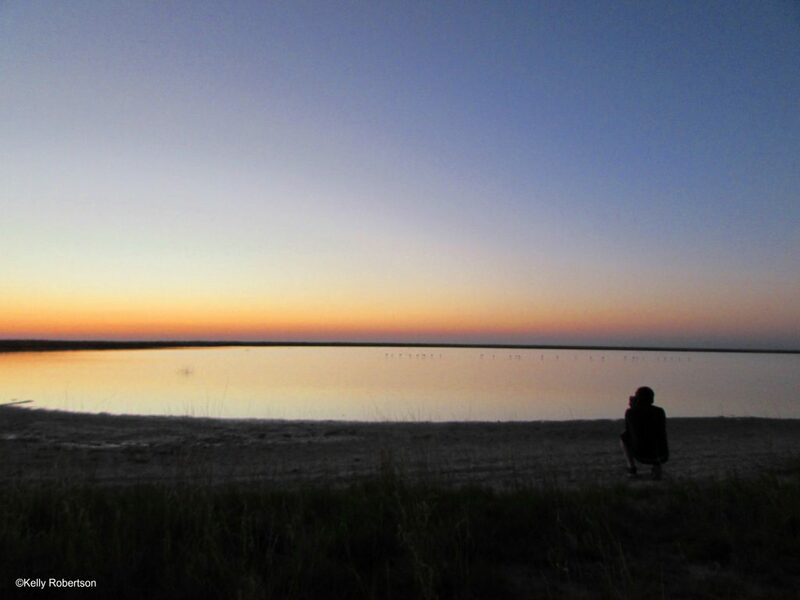 Toasting our first Botswana sunset at the Nata Bird Sanctuary pan. 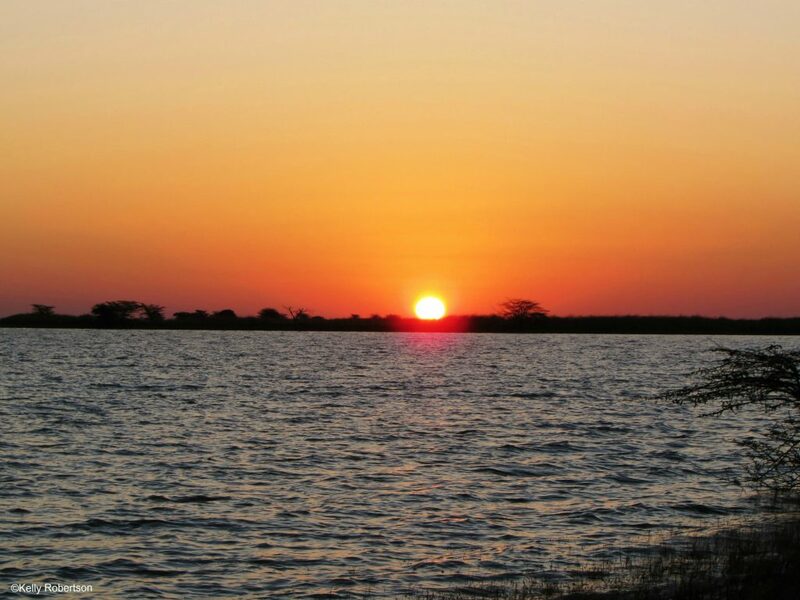 Sunset at Nata Bird Sanctuary, A scene with so much water, it looked like an ocean sunset. 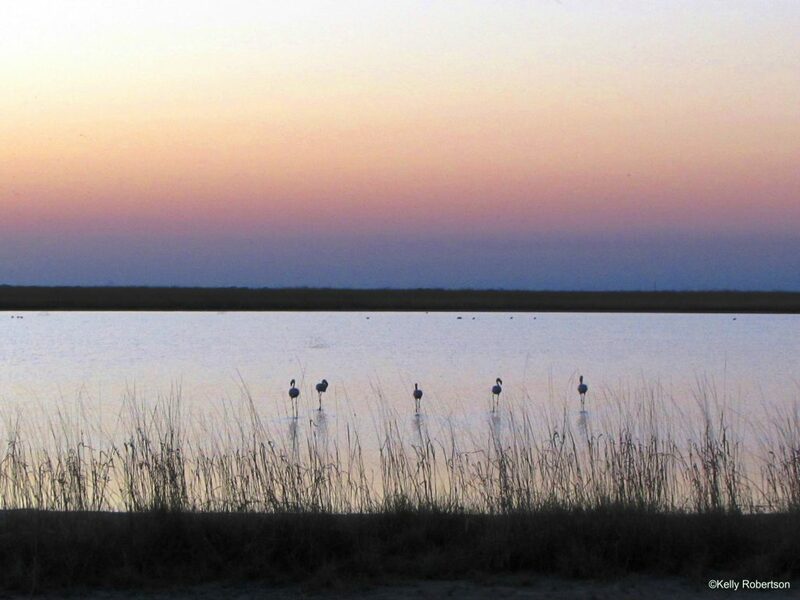 Flamingos posing in the sunset at Nata Bird Sanctuary. Capturing the magic of this special place – Nata Bird Sanctuary. 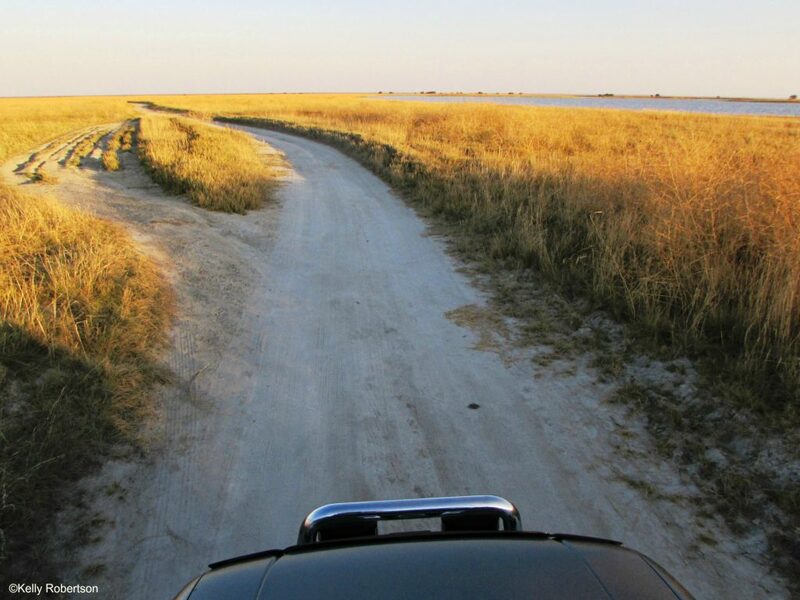 A view of the Makgadikgadi Pans from the roof rack. 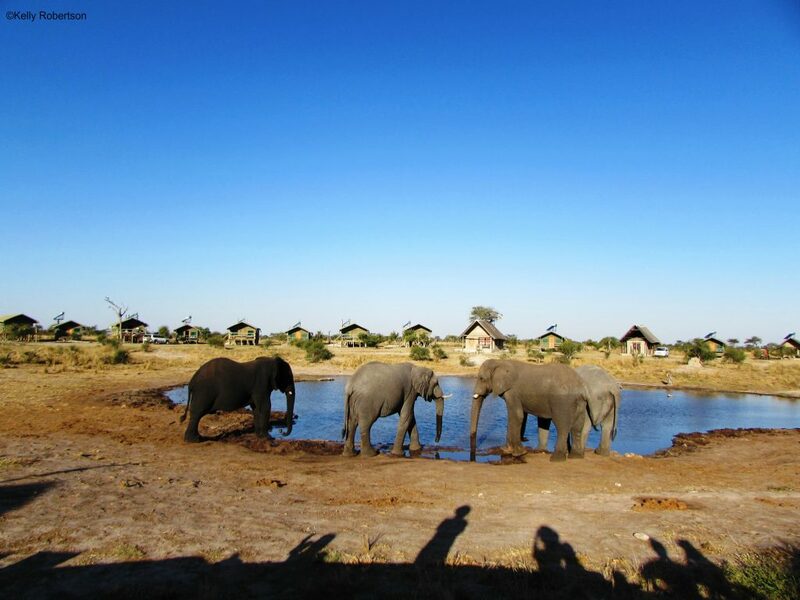 The Botswana elephants were calling and we spent the next day with them at Elephant Sands. 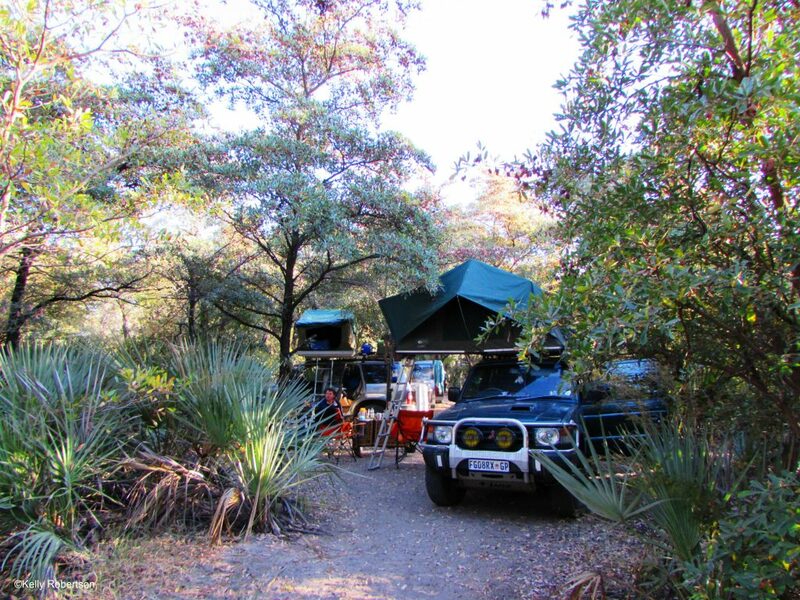 This camp is just an hour’s drive up the A33 road from Nata (towards Kasane) and is in a much wilder setting. 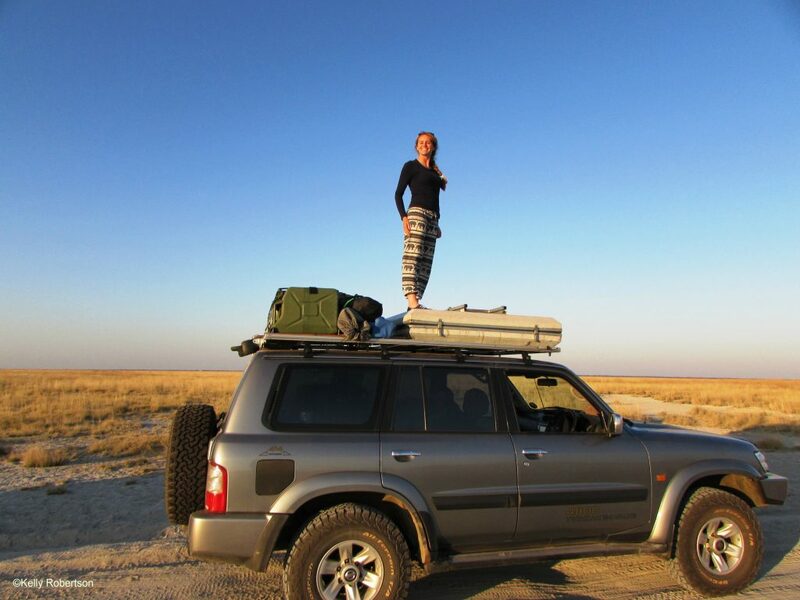 It’s a favourite overnight camping spot for all sorts of travellers including overland tour groups, solo travellers (like the American off-road motorbike adventurer we met), families and couples. 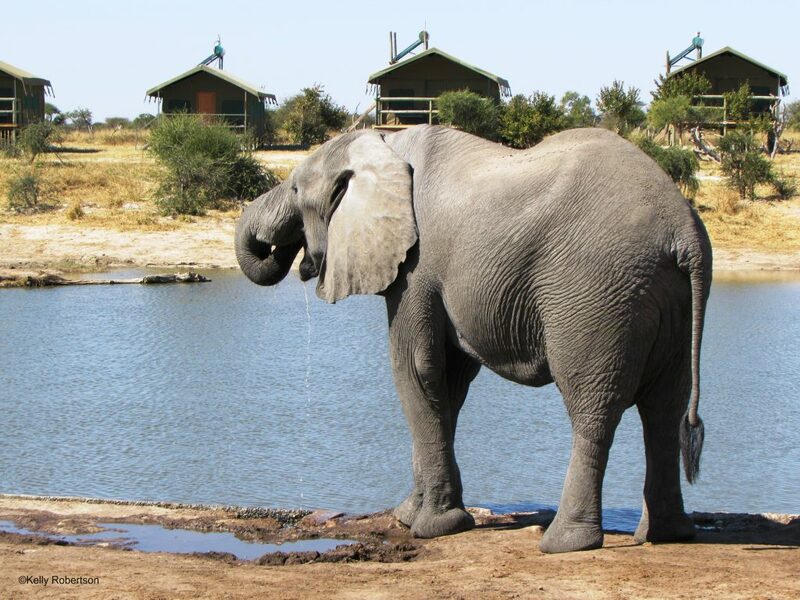 A tall drink of water at the Elephant Sands Bar and water hole. 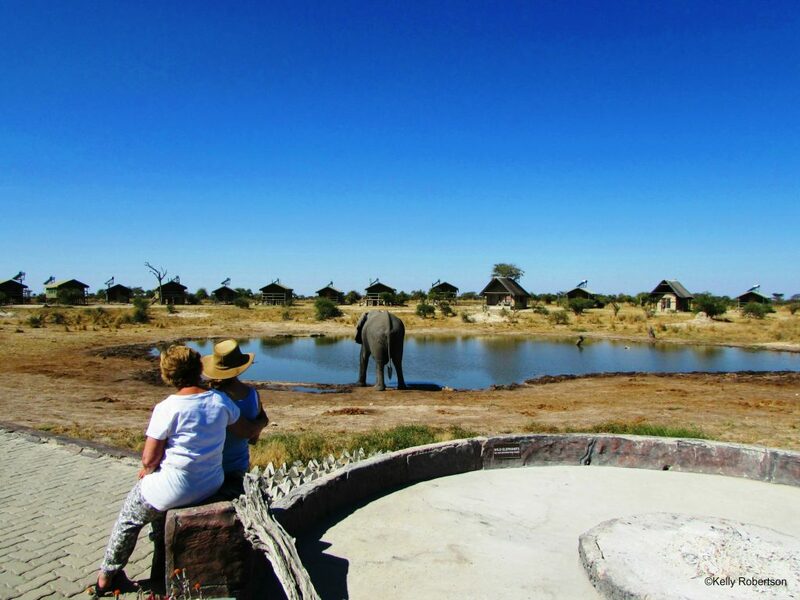 The resident elephants know that the local waterhole in front of the bar is filled daily by a pump, and they are regulars there. 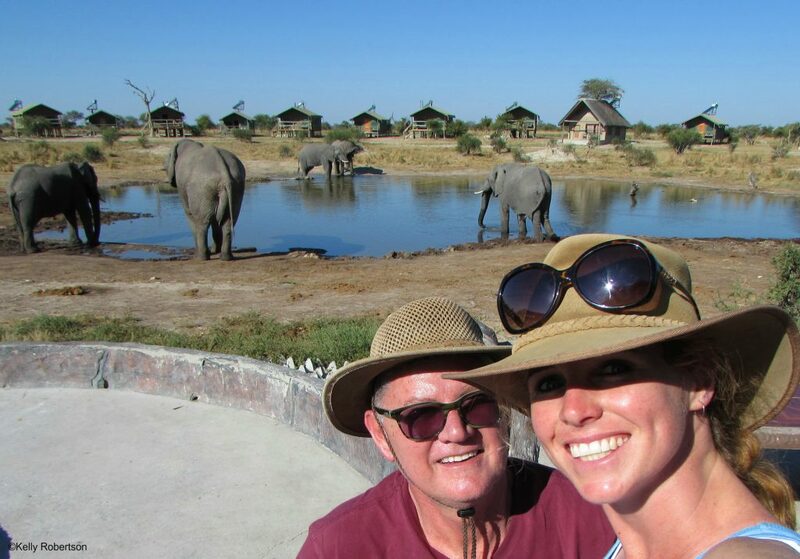 We spent a relaxed afternoon, recovering from our previous day’s drive, in the company of those ellies. We had a few rounds of drinks with them at the bar throughout the day when we strolled between the campsite and the bar area. Taking a dip at Elephant Sands. 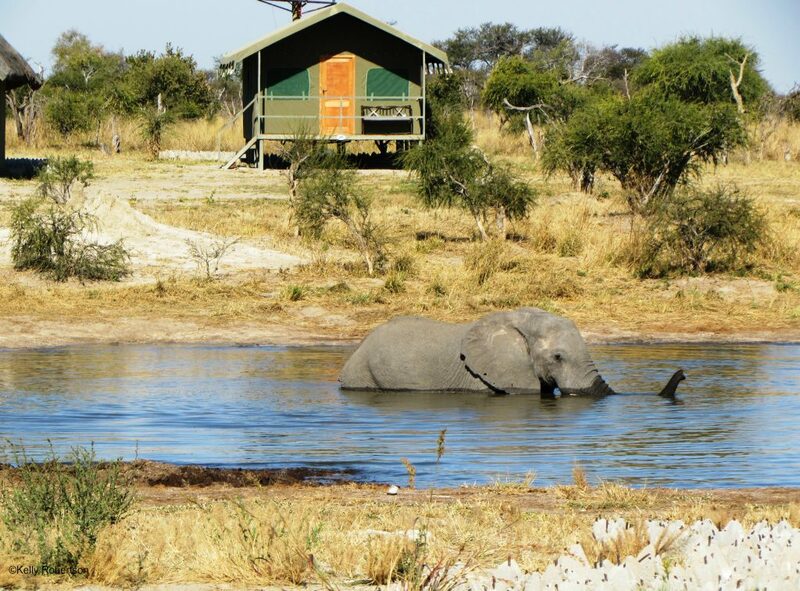 The elephant-created-path towards the water is directly in front of the camp and we’d regularly lookup from our camping chairs to see new great grey characters silently floating past our tents on route to “Happy Hour” and a cool bath time too. It’s amazing how quiet their footfall is. If we hadn’t noticed them walking by, sometimes their “tummy rumbling” communication sounds would alert us to them. 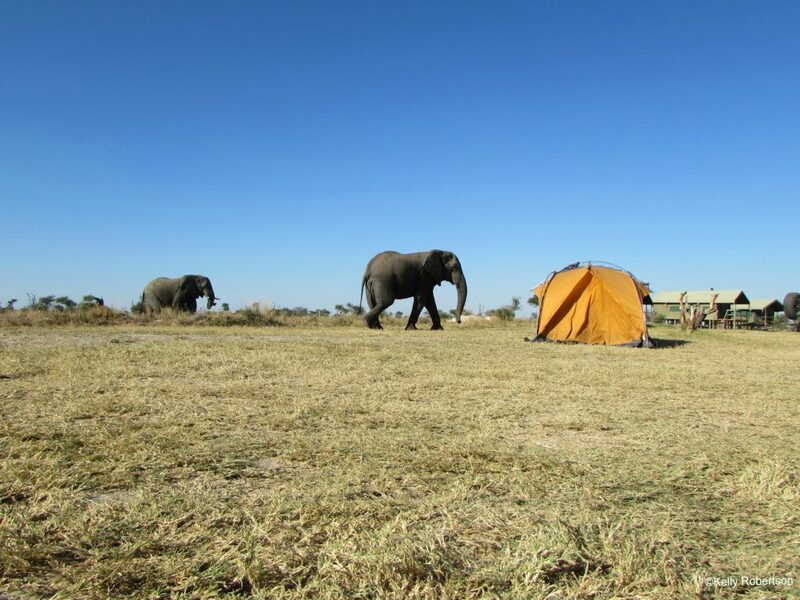 Strolling, silently through the Elephant Sands camp towards the waterhole, because they own the place. Locals get together at their favourite bar at Elephant Sands. They came and went throughout the day and night. 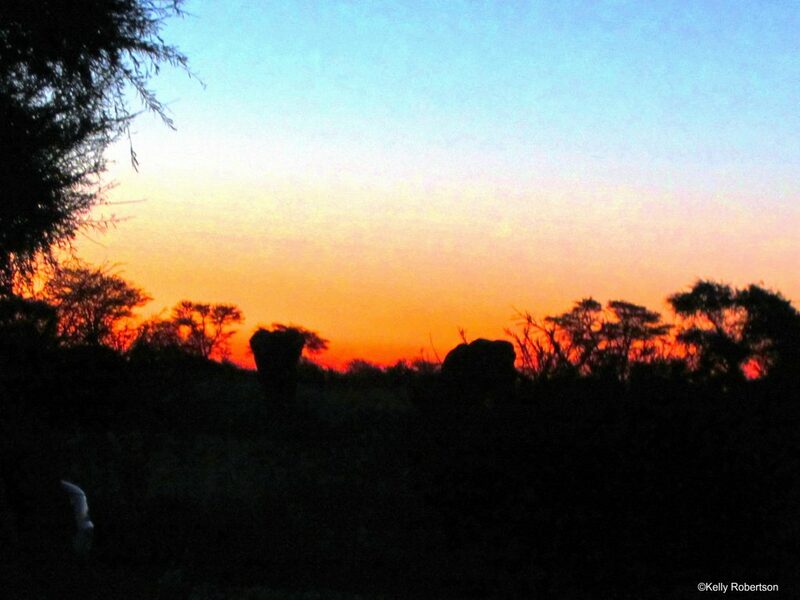 At sunset, as we were putting the first of many delicious Botswana beef steaks onto our braai, the elephant silhouettes contrasted against the pink sky close by, just going about their evening too. 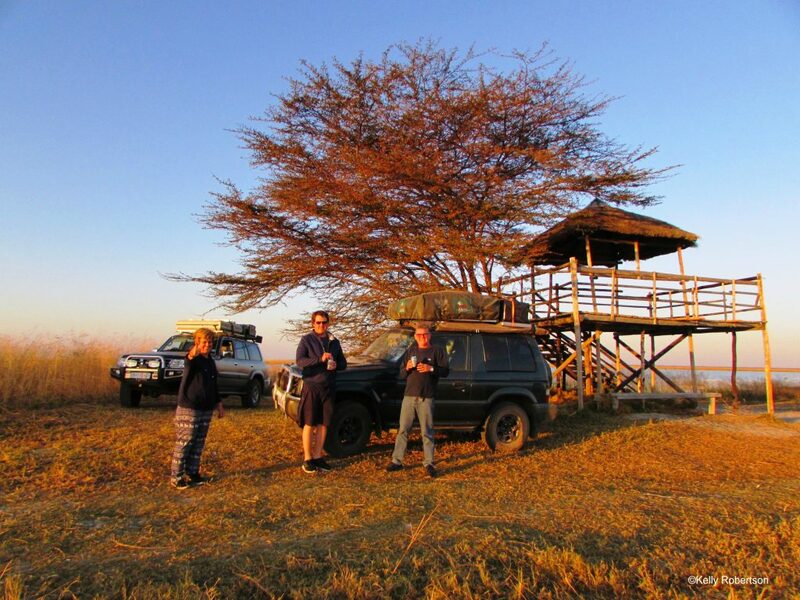 That night we fell asleep to their rumblings and woke later to lion and hyena calls in the distance too. Things were getting wilder. Watching the ellies stroll by at sunset from our campsite at Elephant Sands. Elephant silhouettes saying good night at Elephant Sands. Note: We had filled up with fuel and stocked up with some braai meat and groceries in Nata. This is where we also met an especially friendly village puppy who reminded us of our own Penny at home. She was the first of many Botswana dogs we’d watch from our car windows as we passed through their homes in different regions, all definite Penny ancestors. We’d also picked up firewood from an unmanned wood station on the roadside. The sign said to leave P20 in the empty cool drink can and thanked us for the support. 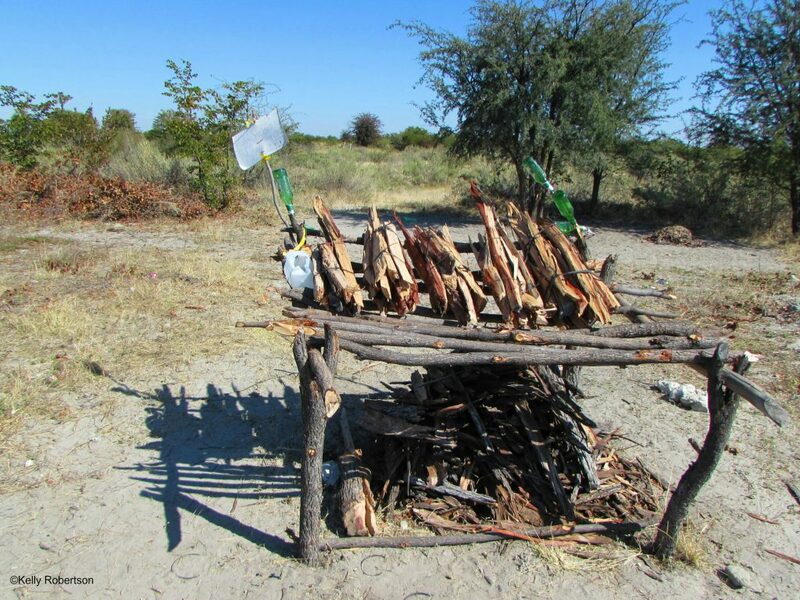 It was the first of many “honesty box” firewood stands we’d support on that trip. 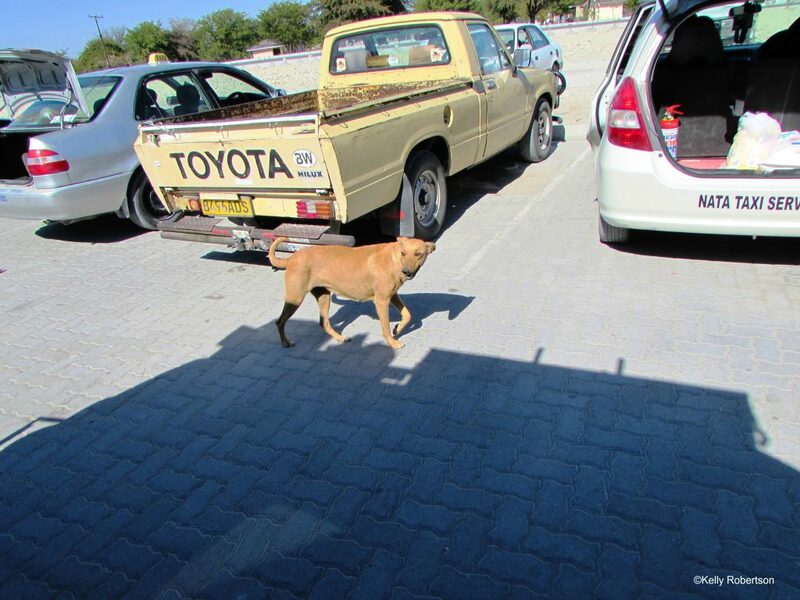 Penny’s family member -a Botswana dog in Nata. A firewood stall run based on honesty. Read more about our route, tips and an overview of the entire trip in part 1 of this blog series here.